Apparently, group interaction is not worthy of NewsFeed status — I am notified every time a friend joins a group, but never notified when someone opens a new line of discussion in a group to which I already belong. 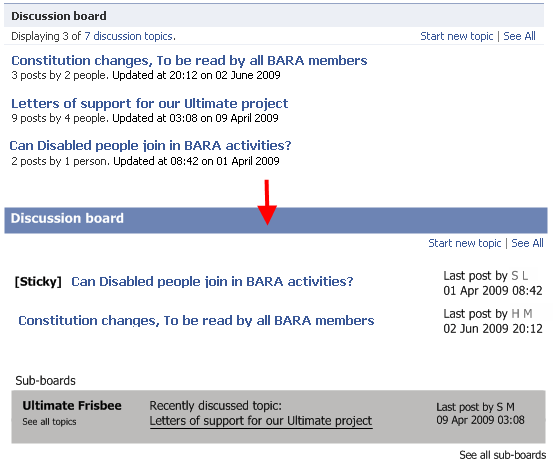 It requires continuous individual mining of each group’s page to see if there are discussions happening. 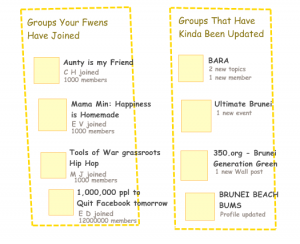 It seems Facebook focuses on getting you to join Groups (e.g. 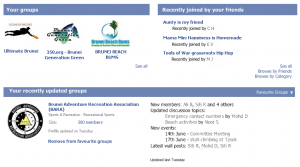 ability to send out Invites, showing in News Feeds which Groups have been recently joined), yet does not keep you up to date with actual recent activity in Groups. The focus is on joining but not participating. Let’s have a look at an entirely objective drawing I’ve made of the current Facebook Groups page. Personally, looking at the above page, I don’t really need to have half the page (on the left) telling me what Groups my friends have joined lately. I don’t need to join all their new Groups. If this information must be there, I’d rather it be condensed. Also, updates are only vaguely implied to. Oh, 2 new discussion topics have been added… but what about the other 2 existing topics that have been updated? Oh, 1 new wall post. Oh, 1 new event. What if I’d logged in yesterday and I had already seen a wall post – is it the same one being implied here or a different one? More detailed Group updates, please. What topics have been updated, and by whom? What new events are coming up? Lastly, I’m sure most people have certain Groups they regularly check up on. You could have a list called “Favourite Groups”. Put this on the Groups main page, or allow to filter by this list by default. 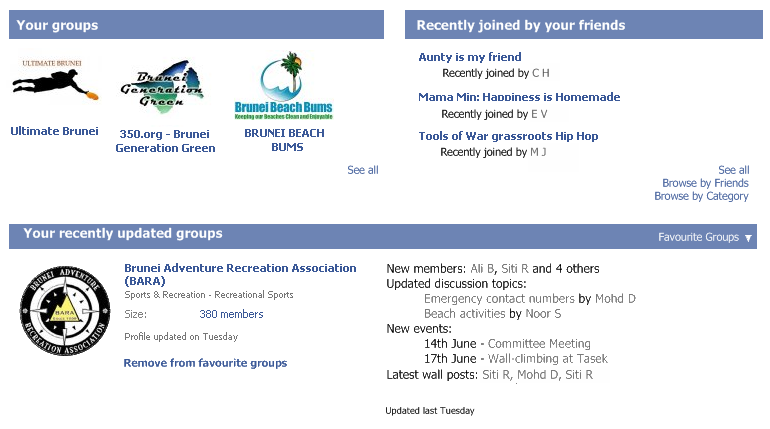 Why not give detailed information of updates for favourite groups? 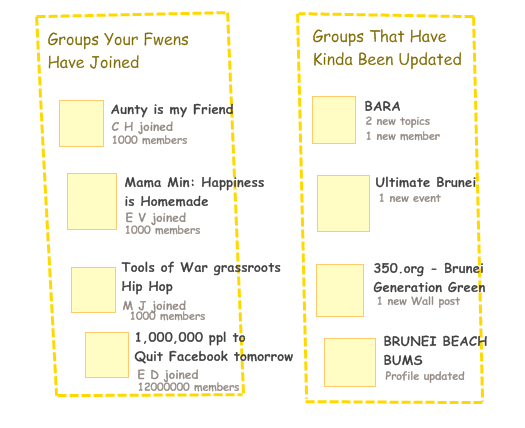 This way, even if the activity’s not on my News Feed, the Groups page is still a useful one that I can bookmark, to see at a glance any new activity that’s been going on in my favourite Groups. These may be moot points. As I said before, I am familiar with forums outside of Facebook, so I take those with me when I browse Facebook Group discussions. And the sad truth (for control freaks like me) may be that Facebook discussions are just not meant for the level of hierarchy and structure offered by other forums. My argument? When Groups do reach certain numbers of active discussion topics, you have to face the inadequacy of Facebook Groups. Time to take it outside guys. Something I’ve always hated: the despised “3 posts by 2 people” line. It forces me to think, unnecessarily. I have to recall whether the topic in question had 2 participants the last time I read it, and if there were less than 3 posts between them, so that I can tell whether it’s worth clicking through again. I think both numbers can be useful, but I’d prefer to just know who the last poster was and when they posted. Now this might more of an aesthetic gripe, but: in certain active and popular groups, there may be more than 3 current or ongoing discussion topics, and it feels cramped to just squeeze 3 into the space, and an annoyance to have to “See all” topics to find the one you want. Perhaps, originally, the space was limited so that the page would not be so long. But now people will saturate the ‘information’ and ‘news’ sections with stuff anyway, that the rationale for limiting the number of ‘featured’ discussion topics is lost. Also, perhaps to tie in with the previous point, why not have sub-boards to cover certain categories of discussion? So instead of trawling through pages of discussion topics (when clicking “See all”), I could just locate the category of topic I need, and reduce my search time. And a last little point, why not allow “Sticky” posts? You might want one so that new members to the Group do not go and post a completely new discussion about a topic that has already been extensively discussed by existing members. Or you might want to keep certain information easily accessible to members. If you’ve ever heard me trying to get any group off Facebook and onto a different platform, this is one of the reasons. In conclusion: It could be a lot better, Facebook. I do not quite buy into reasoning that Facebook Groups were not meant to be used the way I expect to deal with them. They stepped up with everything else! Remember back when you couldn’t comment on a friend’s status? Or “like” someone’s picture or link? Or when the maximum number of photos in a photo album was 60? Where would we be now had Facebook Groups been given more attention earlier? The potential was there. It still is.